Hailing from the county of Merseyside, Cathar, a folk metal band who combine dual male-female vocals with a strong melodic presence and story-driven lyrics, have been announced as the final band for this year’s Northern Symphony Festival. They will be supporting their fellow countymen Ethereal on the Infernal Orchestra Stage, alongside the likes of gothic doom prophets Edenfall and steampunk-soprano unit A Clockwork Opera. Stage times have also been revealed and can be seen down below. 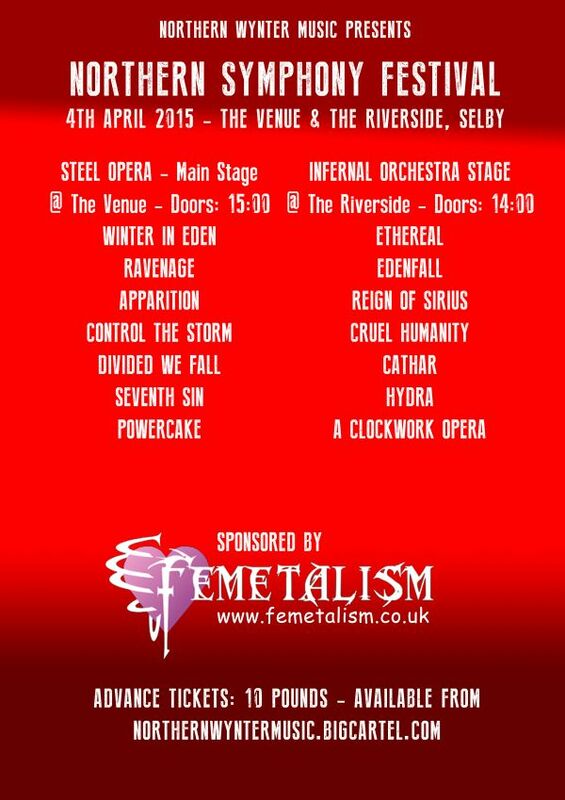 Northern Symphony Festival is the UK’s first ever symphonic metal festival that will take place on Saturday 4th April at The Venue and The Riverside in Selby. Tickets are still available from http://northernwyntermusic.bigcartel.com and a limited amount of tickets will be available for purchase on the door. Since its original announcement last year, Northern Symphony Festival has become one of the most talked about festivals on the international symphonic metal scene, warranting a vast amount of ticket sales from not only British shores but from mainland Europe and the United States.